Trying to remove flippers from Gottlieb system one dragon assuming they just pull off is that correct? Not sure by what you mean by just pulling off. 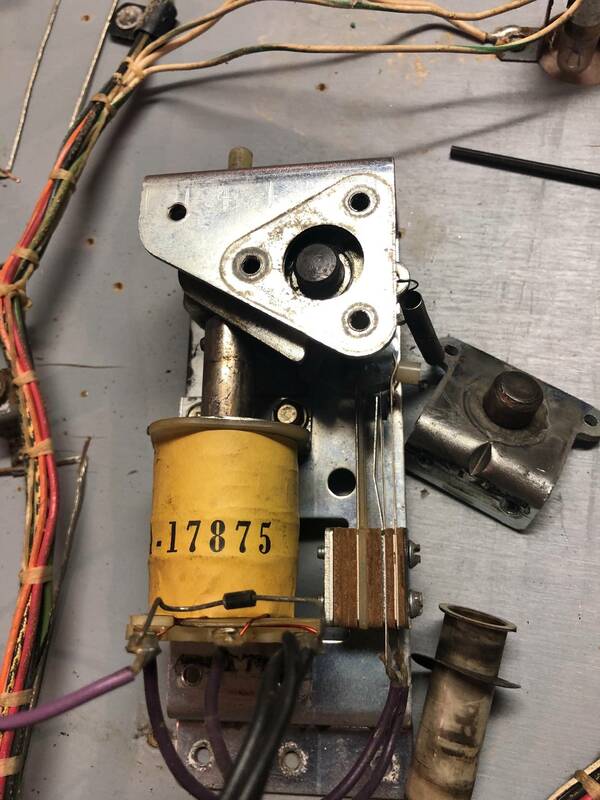 Under the playfield where the flipper coils are, there should be a pawl with two screws - they bite into the shaft of the flipper. Loosen both of those screws - if not sure, you can take them all the way out. When the shaft is loose (The flipper should move freely without moving the pawl) then you can lift the flipper straight out. Sometimes the flipper shaft will have burs from the screws and will drag on the pawl - so there may be a LITTLE bit of resistance when pulling up on the flipper. Still trying to get this flipper post all the way out any suggestions. Did you get the flipper shafts out? If they are still stuck, I've used a wooden dowel to tap on the shaft to get them through the pawl. Make sure you're prepared for the flipper to go flying somewhere, and make sure the flipper has not turned and got under a slingshot plastic.